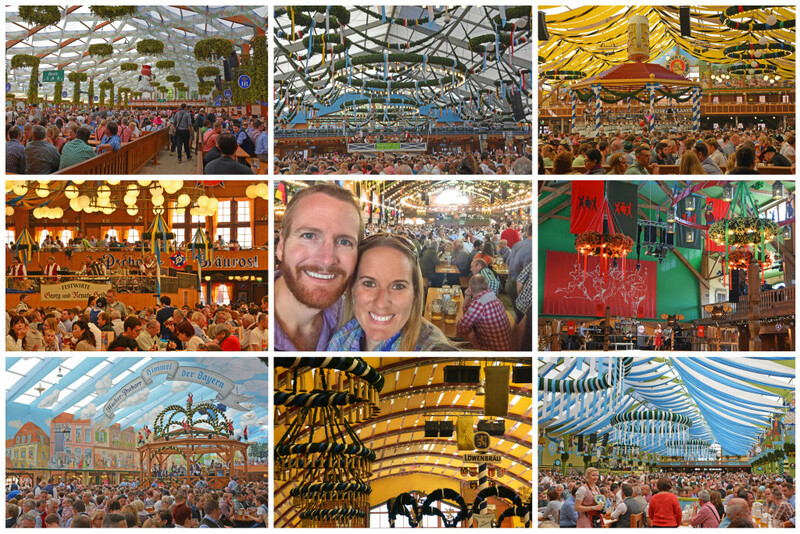 We’re actually not big on crowds, or festivals for that matter, but attending Oktoberfest in Munich, Germany was an experience we wanted to have at least once in our lifetime, and quite honestly, we’re so glad we made it happen. Just a few months later, we experienced St. Patrick’s Day in Dublin, Ireland, but unlike Oktoberfest, it unfortunately didn’t live up to the hype. So, now that we’ve experienced this traditional Bavarian celebration for ourselves, we wanted to provide you with some Oktoberfest tips and insights that will help you make the most of your visit to the world’s largest beer festival! The first Oktoberfest was held in the year 1810 in honor of the Bavarian Crown Prince Ludwig’s marriage to Princess Therese von Sachsen-Hildburghausen. 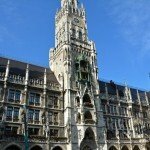 The locals in Munich fondly refer to Oktoberfest as “die Wiesn” because of its location, Theresienwiese, which was named after Therese von Sachsen-Hildburghausen. Bavaria’s purity requirements, as decreed by Duke William IV in 1516, stipulates only water, hops, and barley should be used in Bavarian beer. 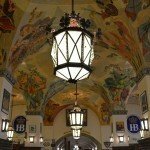 The 6 Bavarian breweries are Paulaner, Spaten, Lowenbrau, Hofbrau, Hacker-Pschorr, and Augustiner, which was founded in 1328, is the oldest, and is said to be the best Oktoberfest beer. Because Oktoberfest is a celebration of Bavarian culture, roughly 70% of attendees are from Bavaria, while 15% are from other parts of Germany, and the remaining 15% come from other countries. Make Plans and Reservations EARLY!! Oktoberfest typically starts the second to last Saturday of September and runs through the first Sunday of October. Close to 1 million people attend opening weekend by the end of the festival, over 6 million people have walked through the festival gates. 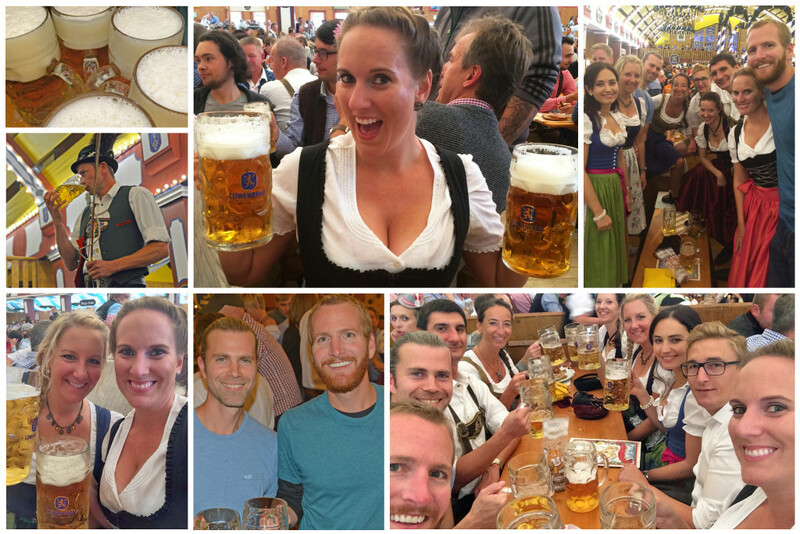 As such, it’s a good idea to start planning your trip to Germany for Oktoberfest sooner rather than later. If you want a guaranteed seat at one of the tables, Oktoberfest tent tickets need to be purchased well in advance (starting in December the year before, and reserved tables are usually fully booked by February/March). 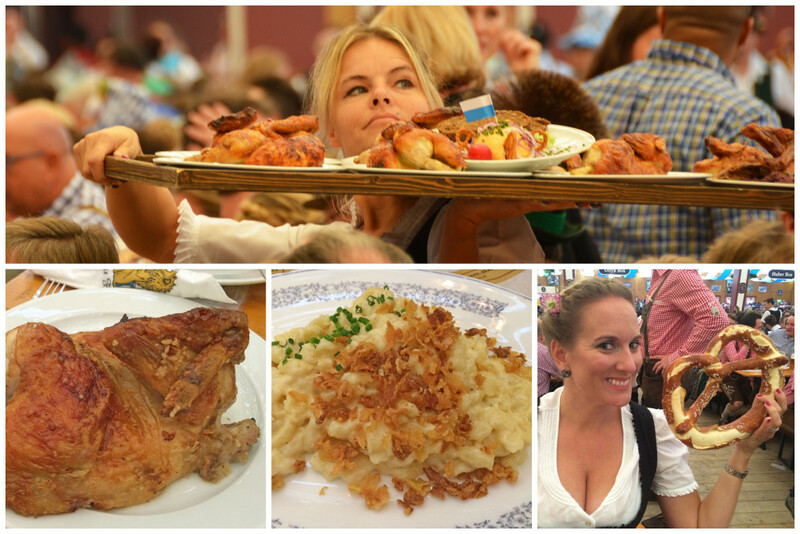 You CAN attend Oktoberfest without a table reservation and we’ll go over how to do just that shortly. You’ll need to reserve your accommodations early (months out) as well, as prices drastically increase and availability becomes more scarce the closer you get to the event. 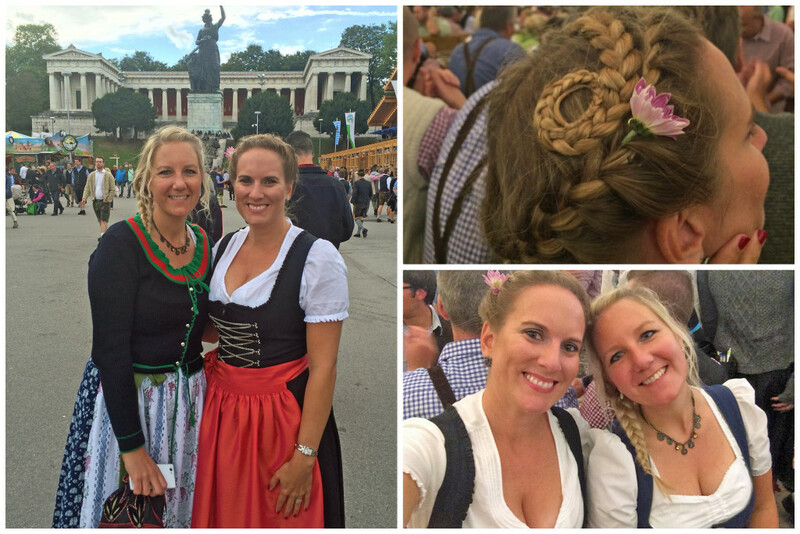 Did you know that you can actually attend Oktoberfest in Munich without tickets?! It’s true! It is completely FREE to enter the grounds and enjoy the festive atmosphere. 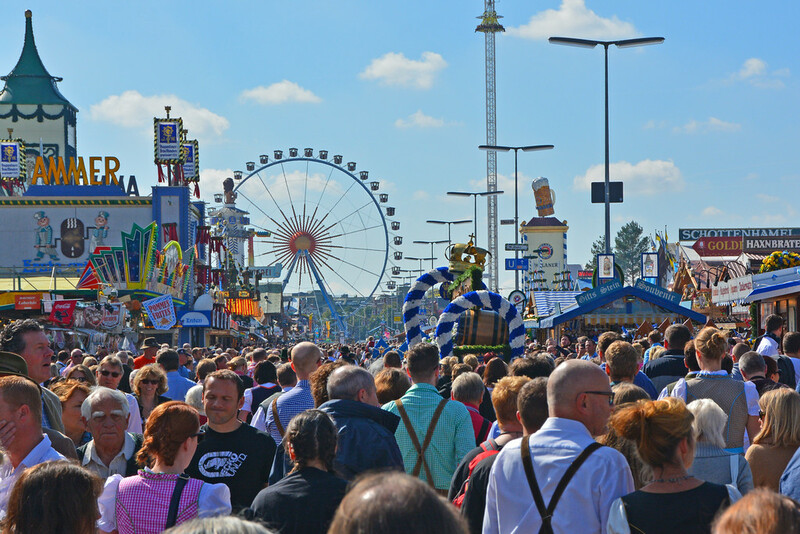 There is much to see and do within the Oktoberfest grounds, such as rides and carnival-style games, and booths selling everything from food and beverages to traditional Oktoberfest souvenirs. If you aren’t able to find a seat inside any of the tents, know that several of the tents also have outside seating areas that are available on a first come first serve basis where you can order beer and food. 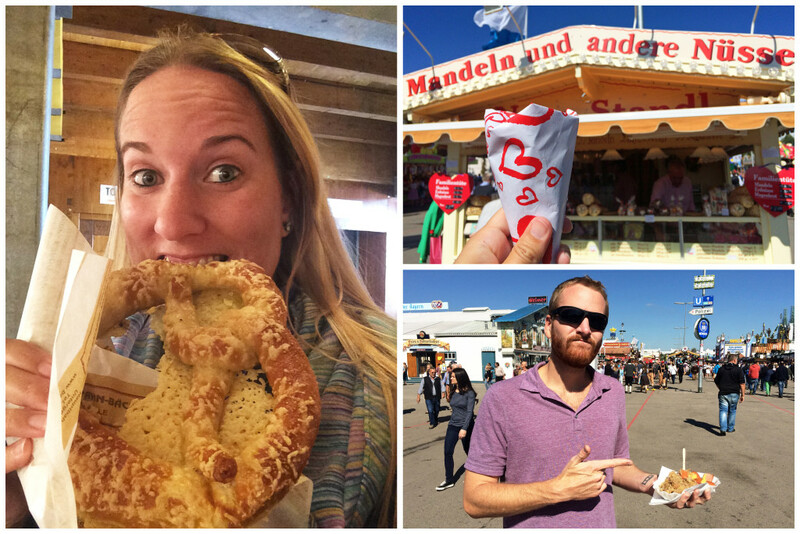 So, know that there is plenty to see, do, and eat within the Oktoberfest grounds. Though entrance into the Oktoberfest grounds is free, the rides are not. You can easily pay at the cash point in front of each ride, so be sure to have cash (Euros) on hand. There are plenty of thrilling Oktoberfest rides to choose from, however if you plan on also drinking while at Oktoberfest, we encourage you to go on the rides before you start tossing back liter steins of beer! 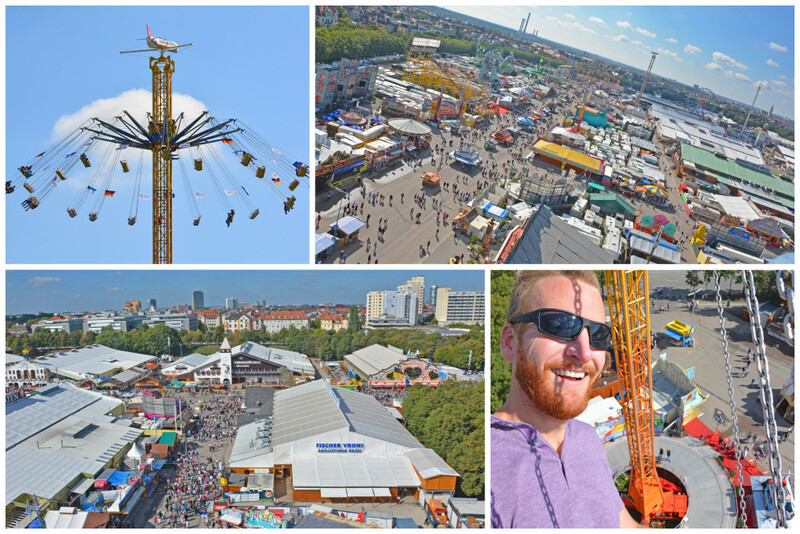 One might think that drinking beer and carnival rides don’t mix, but it goes to show that you can attend Oktoberfest in Munich, NOT drink (or at least wait to drink), and still have a great time! Warning: The flying swings are more intense than they appear! I swear we were experiencing g-forces up there, but the views over the grounds were great! Something else to note is that Oktoberfest is absolutely kid-friendly! Kids are welcome to attend Oktoberfest, ride the rides (height/weight restrictions may apply), and are even allowed inside the tents (though children under the age of 6 are not allowed in the tents after 8 pm). Tuesdays are family days at Oktoberfest with some of the rides and food vendors providing discounts (from 12-6 pm). Throughout the grounds at Theresienwiese are booths and tents offering delicious traditional Oktoberfest food, such as Bavarian pork knuckles, grilled chicken, bratwurst and sauerkraut, candied nuts, gingerbread cookies, soft pretzels the size of your head, and obviously beer! Be sure to have cash (Euros) on hand to purchase these scrumptious indulgences! 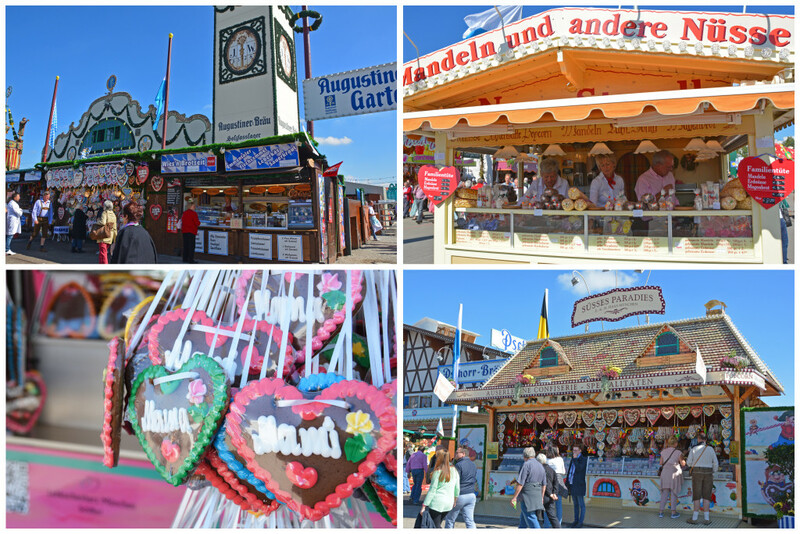 In addition to all of the delicious food, you can also purchase traditional Oktoberfest souvenirs, such as commemorative liter steins, beer glasses, and various trinkets from the booths throughout the festival grounds. A word of warning, you are not allowed to take liter steins from the tents (and they will check you on your way out), so if you’re hoping to take home a souvenir, you’ll need to purchase one. As mentioned, admission into the tents is FREE, so feel free to peek inside all of the various Oktoberfest tents. If you’re lucky enough to grab a seat, you’ll be able to order food and beer. No seat=no beer! You’ll have better luck getting a seat inside one of the tents if you’re not a part of a large party. If the tents are at capacity, you will not be able to enter, so arrive earlier in the day to increase your chances at getting in and securing a seat (before 2:30 pm on weekdays and in the morning on weekends). Tents open at 9 am on the weekends and 10 am on weekdays. While it’s technically free to reserve a table, you have to purchase beer and food coupons in advance for 20€-80€/per person (depending on the tent and time) for the entire table (10 people). There are non-reserved tables in each of the tents, but again you’ll need to arrive early to secure your spot! Close to 120,000 people can be sat at any given time in the collection of beer tents at Oktoberfest. 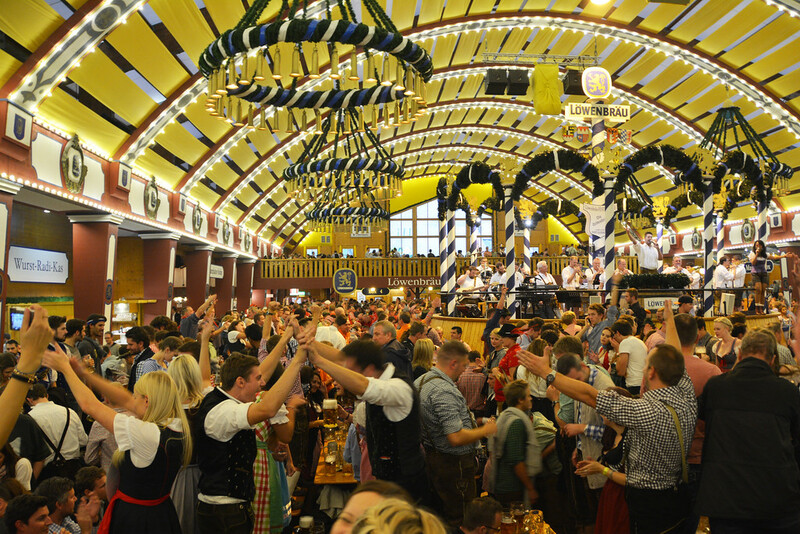 Because a majority of Oktoberfest attendees are Bavarian, a good amount of Oktoberfest guests don traditional Bavarian costume – Dirndl for the women and Lederhosen for the men. 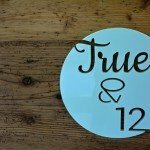 The placement of the tied bow on the dirndl apron is an indication of the woman’s availability – if the bow is tied on the left, she is single and ready to mingle and if the bow is on the right, hands off – she’s taken/married. Wearing traditional Oktoberfest clothing is certainly not a requirement, but it does add to the festive atmosphere! If you’re lucky enough to secure a table reservation in one of the many Oktoberfest tents, that means you’ve already purchased a voucher for an entree and 1 liter stein of beer. Choose from a variety of menu options such as chicken, sausage, pork, salad, soup, or käsespätzle (cheesy noodles/vegetarian). You can also select to have a radler (half lemonade, half beer), if you’d like. Additional food and beers are available for purchase. I simply couldn’t resist having another humongous soft German pretzel to help soak up the beer I was consuming! If you are able to secure a seat without a reservation, food will be available for purchase (cash only). 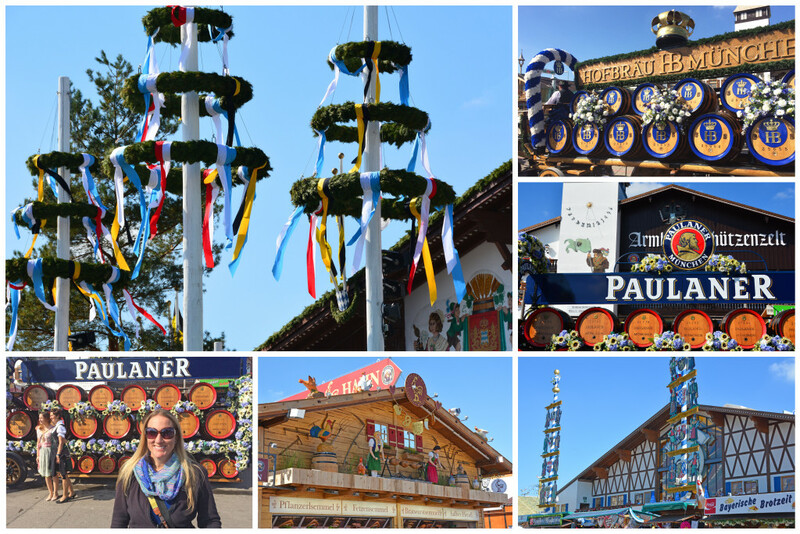 Throughout the day, we wandered the festival grounds, went on a few rides, perused the tents and booths, and sampled traditional food, but now it was time to experience the true spirit of Oktoberfest – gathering around the table with Munich locals we had met during their travels in the US, along with their friends, and throwing back a few beers! It was an experience we won’t soon forget and we’re so glad that we got to experience Oktoberfest in Germany at least once in our lifetime! The meals were served, the beer was flowing, and the atmosphere became quite energetic with a live band performing famous hit songs like Sweet Caroline and Living on a Prayer. We stood on the benches and danced the night away (table dancing is not permitted)! Up until 6 pm, traditional Bavarian music is performed with brass instruments in the tents, but into the night (when we had a table reservation with our local friends), party music made up most of the soundtrack! For more Oktoberfest Tips and other detailed information, including how to make table reservations, check out Oktoberfest.de. Otherwise, just show up and have a blast! This post contains affiliate links, which simply means if you click on one of our links, we may receive a small fee, at no additional cost to you.